I'm having an issue with the new video capture device and my HP s5-1204 running an upgrade to Windows 8 from 7. I purchased the device and when it arrived there was no installation disc for the device so I went to the web site and downloaded what I thought were the drivers. This installed something but not the device drivers. 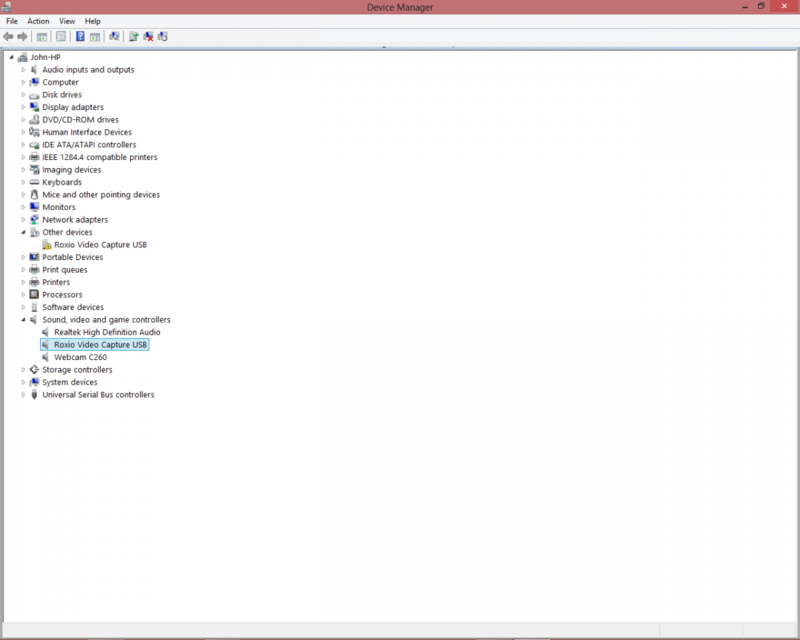 Device manager sees the device but says there no drivers. 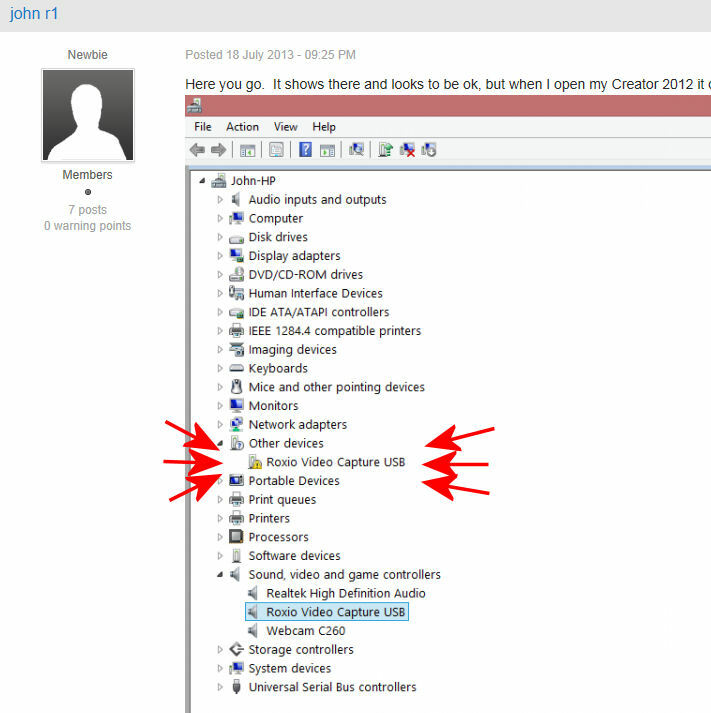 Creator 12 video capture program has my logitech video camera listed but not the usb device. If you really want to frustrated, trying communicating with Roxio support about this. 6 emails later and it appears trying to expalin to a lot of idiots here I am. They keep sending me to a different support site that wants me to register my device and you can't because all they list is software and it's not software. Does anyone out there have a driver that will work with this device? As I said earlier it's the new device, the number on the device is HU3192-E, I'm running Windows 8 on a HP Pavillion s5-1204 Slimline desktop. 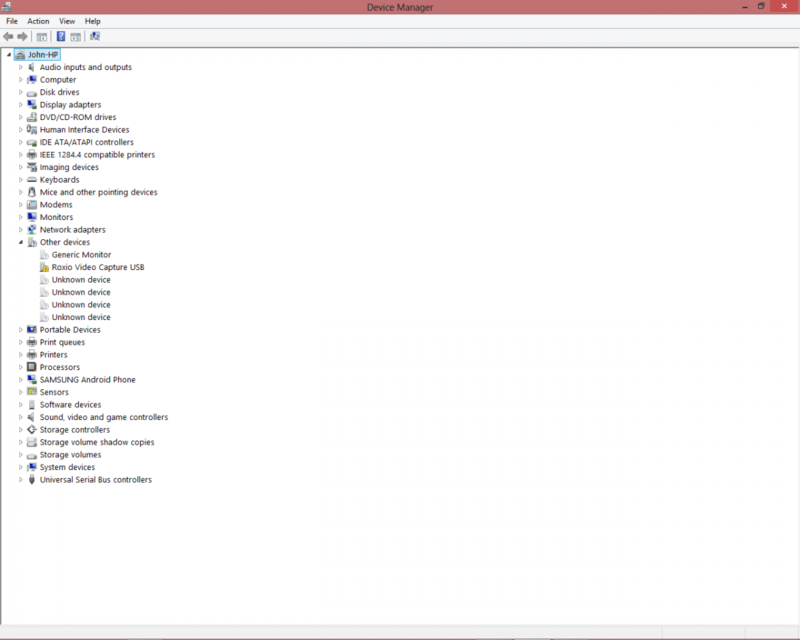 Please expand and post an image of the section for "Sound, Video and Game Controllers" That is where the device drivers should be listed. The other devices don't help much. Here you go. It shows there and looks to be ok, but when I open my Creator 2012 it doesn't show as a video option. You think that Exclamation Mark is significant??? Unplug your Roxio Video Capture USB Device and put it aside until you are completely finished. OK, I've tried that. The same screen shots from above are still showing. I checked the downloaded program from the web site that I installed and it shows files for Vista and XP but not for Windows 8. Why is this so f****ng difficult! There should be a driver for Win 8 out there somewhere! Trying to get anything from Roxio or Corel Support is like pulling teeth. If they had sent the installation disc for the device like they should have this probably wouldn't be an issue. All I want to do is record my daughter's wedding to disc. Is that asking so much?!? Apparently so. Creator 2012, if that is what you have, came out over a year before Windows 8 did. But shouldn't there still be a driver available??????? No, why would you expect a "driver" for software that is not compatible with Windows 8? Maybe because it works in Windows 8. Every program in Creator 2012 works except being able to capture the video from the tape of my daughter's wedding! What is the make/model of your camcorder? You state that C2012 recognizes the camcorder which indicates that you have a digital camcorder. You should be using a Firewire connection to capture the video from digital camcorders not the VHS2DVD device.